November 2018 is the centenary of Armistice day. 100 years ago, the Great War was ‘brought to an end’ after four years, and Remembrance Day this year on Sunday 11th November will be exactly 100 years since that day. In the ‘Sounds of Battle’ case in Harborough Museum, there are objects which help us understand what it was like to be part of a war, including World War One. 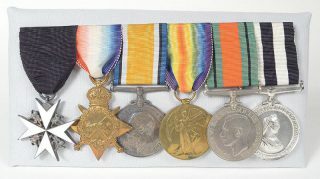 These objects include six medals held together on a pin. There are two St. John’s Ambulance medals, three World War One medals and one World War Two medal, all awarded to ‘Commr T. G. Lowe’ a Market Harborough solicitor. Visit Harborough Museum to learn more about the lives of Harborough people during and after World War One. The War Memorial on The Square is a tribute to 254 Harborians killed in the First World War (1914-1918). The public funded the design and building of the War Memorial, as well as the Memorial Wing of the Cottage Hospital in Coventry Road. It consists of a small cross above a tabernacle (featuring Justice, Temperance, Fortitude, Prudence, Hope, Charity, Faith and Obedience) on a tall shaft. It was unveiled on Sunday 25th September 1921 by Major General Sir R Hoskins; and was dedicated by the Bishop of Peterborough. 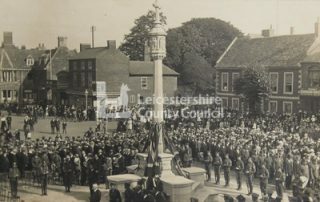 Dedication of War Memorial, Sunday 25th September 1921. Not far from the War Memorial in The Square are the Memorial Gardens, notable for its entrance through some blue iron gates. The gates were requisitioned in 1951 from Gopsall Park in north Leicestershire. Gopsall Hall was a stately home until the early 1920s and was taken over by the No.1 Radio Mechanics School of the Royal Electrical and Mechanical Engineers (REME) during World War Two. The Memorial Gardens were formally opened in 1954. 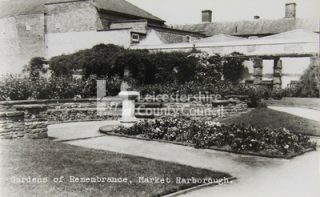 A postcard of the Memorial Gardens.